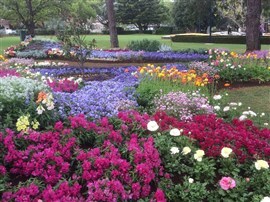 Since 1950, Toowoomba has greeted Spring with an infusion of colour and creativity not only in private gardens but also the towns magnificent parks and gardens. Come and delight your senses in the Garden City as there is no better blooming place! Travel from the Central Coast and the Hunter, meeting your fellow passengers over morning tea, before continuing the journey north. Enjoy lunch on the way, and arrive into Coffs Harbour late afternoon for our overnight stay. Travel along the coastal road to Nerang before heading through the Lockyer Valley, making our way to Toowoomba. On arrival, settle into our accommodation for the next two nights. A local garden expert will guide you on a full day tour of the beautiful private and public gardens. Morning tea will be on top of the range overlooking the Lockyer Valley and Toowoomba City at Picnic Point, before visiting more exhibition gardens and the category prize winners including Best Annuals, Best Waterwise and Good Neighbours. Visit St Luke’s Anglican Church where the Toowoomba Floral Art Group put on a magnificent floral display. Drop into the hall and see a range of arts and crafts by local artisans and enjoy St Luke’s beautiful gardens. After lunch stroll through the stunning Queen’s Park with its large floral array. Tonight we enjoy a guided Twilight Tour of Laurel Bank and Scented Garden Park by torchlight. Enjoy the fairy lights and discover the secret world of the parkland by night. Highfields for morning tea and then travel along the New England Highway arriving in the Granite Belt town of Stanthorpe, for lunch. Continue on through Glen Innes before reaching Armidale for your overnight stay. Travel down scenic Thunderbolt’s Way stopping in the lovely township of Walcha, viewing its unique outdoor sculpture gallery and impressive craft shop. The journey continues over the Great Dividing Range with breathtaking views, before reaching Gloucester. Arrive in the Hunter mid afternoon, and Sydney late afternoon.